"We do not remember � we rewrite memory much as history is rewritten." Born as Christian Fran�ois Bouche-Villeneuve, the reclusive French director known as Chris Marker has gained a devoted following of film critics and cinephiles over the years. Recognition of his work should only increase with this Criterion Collection release of two of his landmark pictures�La Jetee and Sans Soleil. Marker arrived on the Earth in 1921 and began directing films in the early 1950s. Since that time, he has delivered a large group of original creations that are rarely seen outside of special retrospectives. Each picture is a highly unique work, and we're fortunate to have both of them on a single release. Marker's work is on the intellectual side and might not work for many tastes, but it should inspire viewers who are willing to look beyond the conventional movie structure. This renowned short film is generally recognized for being composed almost entirely of still photos, which is a remarkable achievement. However, there's much more to this picture than just a creative gimmick. Jean Negroni narrates this story of a man (Davos Hanich) living in a post-apocalyptic Paris who journeys back in time and falls in love with an image from his past (H�l�ne Chatelain). It's difficult to say too much without giving away the final twist, but I will say it relates partially to Terry Gilliam's Twelve Monkeys. That impressive film took this premise and expanded it into a feature-length production with a grander scope and big-name actors. In both pictures, the main character lives underground in dire circumstances but discovers life in the past. He's almost certainly doomed to an unkind fate, but hope exists that settling in this bright world is actually possible. Chris Marker's success with La Jetee proves that an artist can make an affecting story with very little. Using standard narration, clever sound effects and stunning images, he crafts a tale more haunting than most CGI-driven blockbusters. A perfect example is the shot of Paris being destroyed, which is accompanied by powerful choir singing. These quick shots stay with you much longer than massive explosions and destructions in similar modern sequences. There is one live-action moment to watch for, and its effect is definitely worth the shift. Although it lasts just short of a half-hour, this compelling film warrants multiple viewings to truly grasp Marker's remarkable tale. How do we really know that our memories are accurate? Are they actual images of events that occurred, or recreations by our brain of what we think happened? This compelling 102-minute feature from Chris Marker meditates thoughtfully on this subject while providing an intimate look at several cultures. A highlight is the sharp wanderings through Tokyo, which gives a perspective rarely seen in travel documentaries. We see the early stages of today's technology-obsessed culture and some intellectual thoughts on vintage gems like Pac-Man. The camera moves slowly through the city and its inventive residents, who delve into the latest trends. Serving as writer, director, editor and cinematographer, Marker takes his time and immerses the audience into each community. Narrated by Florence Delay (French) or Alexandra Stewart (English), Sans Soleil follows the loose structure of letters from the fictitious world traveler Sandor Krasna observing Japan, Guinea-Bissau and San Francisco. She goes well beyond describing the images and explores a wide range of subjects pivotal to our future. The San Francisco segment focuses on the sets of Hitchcock's Vertigo and that classic's approach to the mind's inner workings. This is not an "easy" film and defies a simple explanation, but I found it surprisingly accessible. If you're willing to take the ride and absorb the images, this picture could deliver a remarkable experience. Marker combines diverse subjects and locations into a fairly coherent whole that should only be more rewarding during repeated viewings. Image Transfer Review: La Jetee utilizes grainy black-and-white still images, which makes the transfer essential but also limits its overall quality. The 1962 technology of the print does bring some fuzziness to the picture, but it still offers a solid presentation. Sans Soleil was shot 20 years later, but it also contains a significant amount of grain. That's partially due to the low-budget documentary style, and it only detracts slightly from the film's effectiveness. Audio Transfer Review: Both pictures include mono audio transfers with the choice between French and English for the narration. While some viewers will prefer the original French speakers (with subtitles), you can't really go wrong with either option. The dialogue is easily understandable throughout each presentation, with La Jetee's sound effects working especially well. They are pivotal in selling a story comprised almost entirely of still photos. Extras Review: This Criterion Collection release includes insightful features about both films, provided in separate menus. The La Jetee section includes more extras, including more than 23 minutes of material from Jean-Pierre Gorin. The writer/filmmaker/educator covers a wide array of topics within nine short featurettes loosely arranged by subject. The segments each contain a quote from a film expert and then offer a brief interview with Gorin. This is not the standard promotional fare, and instead works like a lecture during a film studies class. We learn about the essay film genre, Chris Marker's philosophies, comparisons to Jean-Luc Godard, and some other intriguing background. No one does this type of feature better than Criterion. We also learn more worthwhile information in Chris on Chris�a short documentary from British writer Chris Darke about Marker. Terry Gilliam briefly appears to praise this film, and we even see footage of Kurosawa filming Ran. This section also provides a nine-minute piece about Hitchcock's Vertigo and its major influence on La Jetee. This filmed excerpt from Court-Circuit (le magazine) includes clips from both pictures and shows the close similarities between certain scenes. Another much-shorter feature from this magazine covers David Bowie's 1993 video for Jump They Say, which incorporates some imagery from Marker's film. I would have liked to learn more details about this video's creation, but appreciate the inclusion. The article seems to imply that David Bowie is an alien and a time traveler, but it's hard to tell if the author is just being clever. The Sans Soleil section contains a single extra feature�a 17-minute interview with Gorin concerning Marker and this film. He discusses the experience of meeting with the director at his workplace, which contains a crazy collection of videos and other materials. Gorin also covers Marker's influences, the film's opening, and other memorable sequences. Criterion has also provided an excellent text booklet containing a large group of essays and articles. The best inclusion is a 2003 interview with Marker himself, who describes his concerns with home video and television in general. He does express admiration for wonderful recent series like Firefly and The Wire, which is always good to hear. Other notable entries include This is The Story by Catherine and Andrew Brighton, which conveys their experience in first seeing La Jetee, and The Patheorama�a brief essay from Marker about his filming approach. 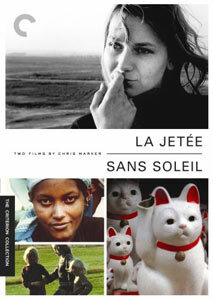 Criterion scores again with this long-awaited release of La Jetee and Sans Soleil. Chris Marker is pretty much an unknown commodity outside of some limited film circles, and he deserves much-wider recognition. The essays and on-screen extras offer an intelligent exploration that will enhance your appreciation of both films. This top-notch DVD has plenty to offer and deserves a strong recommendation.